Does it override the need for the OBB file? Yep. That's a bit strange, but it really works. Odd, it doesn't seem to work for me at all. Are you using the internal or external storage? Edit: No luck with either. I extracted files from .OBB into Android/data/com.rockstargames.gtavc/files. Game need .OBB to run, but it can read files from directory, which I mentioned. Can anyone check that? This can work with packed textures from VC. Do have anyone how to disnable the Cop stars, I cant not win the mission with hillary for the bank job. Do some one know the HEX to change the stars? When you exit the bank with Hillary and Phil just spam m4 or mp5, it will auto lock-on and kill the cops then get into the taxi, wait until phil opens the door, drive up the road to the pay and spray then drive back . If you have random crashes, restart your device. I had random crashes every 5 minute, I restarted my phone and played 40 minutes without any crash. Might just do that, haven't restarted since I downloaded it. I saw it being called "L3D" in a bunch of LCS/VCS topics, i think Ash_735 might know where the name came from. Indeed I do, the Internal name for the engine is actually referred to as the R*L3D engine, a custom engine set out to kind of emulate renderware but also work in its own way. For now it isn't possible. Textures are in packs, which we can't open yet. 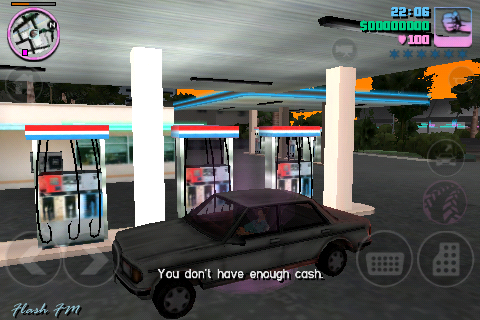 Delivered 3 cars to sunshine auto's, crash -.- time to restart. The game's out for Android? I can't find it on Google Play anywhere. Using Xperia Play R800i with Custom Ice Cream Sandwich 4.04 rom. I was doing the mission "Keep your friends close"
I was up to the part where you chase lance up to the rooftops. I got killed by the Gun Men, I chose to retry and then my game crashed. Loaded the game back up, crashed. And now my save file is screwed. I'm going to complain to rockstar games. Could someone give me some info so I could try to downgrade the textures so I can possibly stop the game from crashing every 5 to 10 minutes? It's not possible yet. All textures are packed into .dat file, there is no tool to open it. I thought that the myriad islands mobile test proved that adding new txd's is possible, so surely you can just edit every .ide's txd filenames and then make downgraded txd files with those new names and put 'em into the gta3.img (or differently named equivalent). I thought that the myriad islands mobile test proved that adding new txd's is possible, so surely you can just edit every .ide's txd filenames and then make downgraded txd files with those new names and put 'em into the gta3.img (or equivalent). Yes, adding new, but what about existing txd's? The post you just quoted is me explaing how to do that to existing txds. About restoring the missing stuff: Nice. My try with changing TXD don't work. Also DFF file structre is edited, I can't import map models into 3D Max. Edit: Generic.txd on PC. It seems the texture is in low quality on PC. Might be because of my device. My brother has the game on his iPhone 5 and it looks wonderful compared to the 4g one. Might get the generic.txd from him if he will let me. Well I opened up the generic.txd from PC and the iPod Touch 4G versions. Both are the same resolution. Exept the 4G one is compressed in ether DXT1 or DXT3. On the PC it says 32 Bit. Bad news about Android modding. While we can edit the files, it won't pass file checks. The checks are part of Google's system and isn't the fault of Rockstar. Every time you launch the game, Android runs a quick check on the file hashes and if it doesn't match it'll attempt to re-download the game. There doesn't look like an easy way to bypass it either. explain to me how you already have it? Alright so I have a few theory's on how to crack this whole txd issue. I'm currently at work and don't get off till 5:00 (2:24) but I will try this when I get home. >>This is the idea that will most likely not work, I think R* is smarter than that. That makes sense, Rockstar Leeds 3D Engine. No, they are not zip files. Models and some collisions are stored in the traditional img/dir files using the same IMG format as regular VC. Textures are stored in a new format consisting of the three files (dat, tmb, toc) following file name structure of [dirname]. [video chip abbreviation]. [extension] Example: gta3img.pvr.dat gta3.pvr.tmb gta3.pvr.toc. Abbreviations seen so far: pvr (PowerVR), dxt (NVidia Tegra gpus) and "etc" (the name is actually etc; 6-to-1 compression similar to DXT1; refers to all other devices). The dat files are the biggest files so they should be the ones that actually contain the texture data, the other two files look to be some kind of structure file.
. This file might be used by the game as the Android executable has references to these values from the txt. The iPhone version of the game seems to allow you to bypass these new texture archives and add regular PC textures to the GTA3 IMG archive. The Android version however doesn't seem to like this and crashes. This could be due to the problem discussed in the next line. One huge problem is bypassing the quality levels. In GTA3 mobile you could just delete the high quality files. With VC, they are using a new file structure and this trick doesn't seem like it'll work. Since the game chooses which files to read based on your phone, this can cause huge problems making sure mods work cross platform. As for file placements, the iPhone version just puts all of the games files into one huge folder except for the mission audio files and a few other support files. Those files are found in a zip file called IOSFiles.zip. Android on the other hand uses an actual file structure that is similar to VC on PC. The biggest difference being all of the model and texture files being stored in a new folder called "texdb". The gta3.img file has also been relocated into this folder. To edit the Android version, you'll need to place the file you want to replace using the same structure as the OBB file in your internalsd/Android/data/com.rockstargames.gtavc/files folder. To extract the game's OBB file, you'll need to copy it to your computer from internalsd/Android/obb/com.rockstargames.gtavc/main.7.com.rockstargames.gtavc.obb and then change the file extension to ZIP and extract the files with a ZIP program. Editing the OBB file directly currently isn't possible nor are we able to get rid of it at this time. @zzcool, this isn't a general discussion. You want to talk about something else, do it in PMs. @zzcool, Too add, I haven't received anything from you via Email nor PM. Textures are stored in a new format consisting of the three files (dat, tmb, toc) following file name structure of [dirname]. [video chip abbreviation]. [extension] Example: gta3img.pvr.dat gta3.pvr.tmb gta3.pvr.toc. Abbreviations seen so far: pvr (PowerVR), dxt, etc. The dat files are the biggest files so they should be the ones that actually contain the texture data, the other two files look to be some kind of structure file. There is also a lone txt file for each img file that seems to be some kind of directory file for texture information. Example of the data inside: ""admiral868bit128" width=128 height=128 png=683986b8 img=cd23d4a1 cat=15"
I made a special version of gasoline mod for 10th anniversary edition. It also unlocks mainland from the beginning.